We have wreaths and garland in the Christmas shops. Several fraser fir wreath sizes and shapes are available: traditional circle wreath, crosses, and candy canes. Fraser fir, white pine or mixed garland (ropes) may also be selected in varying lengths. Some items are handmade right in the shop before you. Others we buy from people we know locally. Either way, we know you will be pleased. 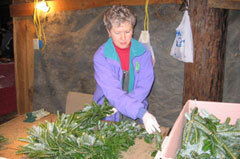 Our wreaths and garlands are fresh, fragrant, and soft. Select the perfect one for your family or friends and take it home with you!